While he shrugged off the increasingly popular notion of an intensifying war between top tech companies, Facebook CEO Mark Zuckerberg used sharply different words to describe Amazon and Apple than Google in an interview with Charlie Rose to be broadcast tonight. Meanwhile, “Google, I think, in some ways, is more competitive and certainly is trying to build their own little version of Facebook,” Zuckerberg said. Facebook COO Sheryl Sandberg added that Facebook’s competitive stance should be pretty clear to others in tech, because it doesn’t want to diversify its products. “We are focused on doing one thing incredibly well,” she said. That is: helping people connect. Facebook would never build its own games, the two execs insisted. “We just believe that an independent entrepreneur will always beat a division of a big company,” Zuckerberg said. Facebook is a platform for applications and a social layer for everything, he and Sandberg said. Rose also got in questions about IPO plans, privacy, hiring, China and more in the interview. Here’s a video highlight and the very long transcript. Charlie Rose: It’s an extraordinary reach. Someone said it’s the most expansive human enabler of communication, or an enabler of human communication there has ever been. Charlie Rose: You’re doing well at it too. So what’s the mission? Where is this thing going? Mark Zuckerberg: So the stated mission of the company is to make the world more open and connected, right? And the idea is that when you give people this ability to stay connected with all the people they care about, and you make it so they can express new things about themselves or in communication with other people who they care about, then you just open up all these new possibilities. You make it so people can stay connected in ways that they couldn’t before. They can learn about new things, whether it’s events that are happening in the world or ability to organize new things or learn about new products or new movies or music that they want to listen to. It opens up a lot of new possibility when you can keep all of these connections open to the people that you care about. So obviously, a big part of our mission is just connecting all these different people in the world. And one of the things that we are really proud of is that now 800 million people around the world are using Facebook every month and perhaps even crazier — it’s mind-blowing from my perspective. But more than half a billion people use Facebook every day. And I just think that’s crazy. Sheryl Sandberg: 500 million people in your dorm room. Mark Zuckerberg: The funny thing is that, you know, I used to talk to a lot of my friends when I was at — when I was in college. We used to go out to get pizza every night. And we used to talk about what we thought was going to happen in the world and on the Internet. And we thought that there would be something like this, right, that, you know, it seemed pretty much inevitable that people would have a way to connect and that they would be able to express all these things and that there would be tools to make not just a social network, but that every product that you use is better off with your friends. We figured that there would be tools to do that. But the big surprise of this thing is that we’ve played a big role in making that happen. And when we were in college, we just figured, you know, who are we to do this, right? I mean, maybe we can create this cool little community for ourselves in college, but clearly it’s going to be some other company that does it. Charlie Rose: That’s what it is, a web within a web, is it not? Charlie Rose: It’s a personalized web within the web. Mark Zuckerberg: I think it’s shaping — it’s shaping the broader web. Mark Zuckerberg: I mean, right now, if you look back for the past five or seven years, the story of social networking has really been about getting these 800 million people connected, right, so that they can stay in touch with all these people who they care about, and getting them signed up for Facebook and all that. But if you look forward for the next five years, I think that the story that people are going to remember five years from now isn’t how this one site was built. It was how every single service that you use is now going to be better with your friends because they can tap into your friends, right, so whether it’s, you know, music services that we just announced this new product a little more than a month ago and since then some of the music services that are out there, Spotify has grown from a little more than three million users with Facebook to now more than seven million users with Facebook. Another service called Mog [spelled phonetically] has grown from I think it’s a relatively small number of subscribers but it’s grown by four or five times in the last month alone. Mark Zuckerberg: And I think what that just shows is that all of these different products are better when you’re doing them with your friends. I mean think about it, do you want to go to the movies by yourself or do you want to go to the movies with your friends, right? You want to go with your friends. Charlie Rose: Or do you want to know what your friends like rather than what a whole different [unintelligible] likes. Sheryl Sandberg: It’s the wisdom of crowds to the wisdom of friends, you know. Charlie Rose: – so that’s Google versus Facebook right there. Charlie Rose: The wisdom of crowds versus the wisdom of friends? Sheryl Sandberg: – which is about information and about links. And it was a lot of wonderful things, mostly based on anonymity and links between crowds. Charlie Rose: Right, right, right, right, right, right, right. Sheryl Sandberg: What does the crowd think? What is the best thing? Ours is just structured a totally different place so it is an evolution. The information web still exists, it’s still broadly used, but the social web didn’t exist before. The social web can’t exist until you are your real self online. I have to be me. You have to be Charlie Rose. He has to be Mark Zuckerberg. I have to be Sheryl Sandberg. Once we are online as ourselves, connected to each other and our other friends, then you can have the evolution of what becomes the social web, not just on Facebook but throughout. Charlie Rose: What is it about that people want to be on Facebook, they want to talk about themselves, what is the sort of essence of that? Mark Zuckerberg: I think that people just have this core desire to express who they are. And I think it’s always existed. Mark Zuckerberg: One of the things that I think makes us human. But yeah and obviously to know what’s going on with your friends’ lives or not just your friends but people you care about. Right? You know, people who you’re interested in who aren’t your friends who are maybe on the periphery of your social circle, yeah, I think that those are all just core human needs and until Facebook there wasn’t a great tool for doing that, but I think that a lot of that and building that up was the last five years. I think the next five years is going to be about, okay now you’re connected to all these people, now you can have a better music listening experience, you can have a better movie watching experience, you can see what your friends are reading and learn what news you should read first, all of these things I think are going to get better. And that’s the thing that I’m most excited about for the next five years. And if we do well I think five years from now people are really going to look back and say wow, over the last five years all these products have now gotten better because I’m not doing this stuff alone, I’m doing it with my friends. Sheryl Sandberg: And it’s personal, it’s not just that you’re bringing your friends with you and then it becomes personal to you. So if you look at how people use most of the web, most products out there, even if you’re logged in, if I looked over your two shoulders, you see the same stuff because it’s basically produced for the masses. Sheryl Sandberg: And ours is different. Charlie Rose: Is the key to the monitorization of the future the fact that advertising will believe this is the best way to reach people, who are likely to buy their products? Sheryl Sandberg: Marketers have always wanted you know personal relationships with consumers or relationships where consumers do two things, consumers buy their products and consumers tell their friends to buy their — that they buy their products. Marketers have always been looking for that person who’s not just going to buy but spread the word to their friends. What we do on Facebook is we now enable marketers to find that and then if I do it on Facebook I’m sharing with an average of 130 people. And so it becomes a word of mouth marketing at scale, so people can tell each other what they like which is for marketers the thing they’ve been looking for I think for a long time. Charlie Rose: Is there a limit in terms of how many friends you should have? Sheryl Sandberg: It’s very personnel. Mark Zuckerberg: – I think that humans have a capacity for different amounts of social relationships. And I think it varies from person to person but it’s also not about what you should do. You should use the product to keep in touch with whatever set of people you want to. And we try to build all kinds of products that make it so you can stay in touch with small groups. All right, we have this groups product that you know it’s I think it’s 300 or 400 million people who are using it on a monthly basis now in order to communicate on Facebook with a subset of their friends, right, not their whole friends list, something that’s very widely used and a lot of people want to do that. And then we have functionality where people can publish things publicly, right? And some people have tens of thousands or hundreds of thousands or even in some cases millions of subscribers who they can publish to and communicate with. So I mean people have a variety of different communication needs and we strive to build products that help people set [spelled phonetically] all of those. Charlie Rose: What’s the valuation today of Facebook? Sheryl Sandberg: So we’re a private company so we don’t really have a valuation. Charlie Rose: So then why do you want to be a public company? Why do you even think about an IPO? Mark Zuckerberg: I actually think the biggest thing for us is that a big part of being a technology company is getting the best engineers and designers and talented people around the world. And one of the ways that you can do that is you compensate people with equity or options, right, so you get people who want to join the company, both for the mission, right, because they believe that Facebook is doing this awesome thing and they want to be a part of connecting everyone in the world, but also, if the company does well, then they get financially rewarded and can be set. And, you know, we’ve made this implicit promise to our investors and to our employees that by compensating them with equity and by giving them equity, that at some point we’re going to make that equity worth something publicly and liquidly, in a liquid way. Now, the promise isn’t that we’re going to do it on any kind of short-term time horizon. The promise is that we’re going to build this company so that it’s great over the long term, right. And that we’re always making these decisions for the long term, but at some point we’ll do that. Mark Zuckerberg: Yeah, whether it’s a dividend or not, they’ll be able to trade their equity for money. And you know, that’s something that we take seriously, as a responsibility of running the company. And we just care deeply about all the employees and the investors who have been there with us. Charlie Rose: Has the Groupon experience and has other things changed your sense of the timing of an IPO? Mark Zuckerberg: I don’t — I don’t think so. Charlie Rose: You’ll go when what? When will you decide? Sheryl Sandberg: When we’re ready. Charlie Rose: No, but how — what will tell you it makes sense? Mark Zuckerberg: I don’t know. It’s a good question. Yeah. Charlie Rose: But you’ll just know? Mark Zuckerberg: I mean, yeah. It’s — honestly, it’s not something I spend a lot of time on a day-to-day basis thinking about it now. Charlie Rose: How do you measure the impact that we now believe social media play in the Arab Spring? Mark Zuckerberg: Yeah, my personal take on this is that it’s — the social media’s role is maybe a bit overblown in that. I mean, the way that I think about it is that if people want change, then they will find a way to get that change, right. So, whatever technology they may or may not have used was neither a necessary nor sufficient case for getting to the outcome that they got to, but having people who wanted change was. So, I mean, I hope that Facebook and other Internet technologies were able to help people, just like we hope that we help them communicate and organize and do whatever they want to every single day, but I don’t pretend that Facebook didn’t exist, that this wouldn’t even be possible. Of course, it would have. Charlie Rose: Yeah, but it certainly accelerated it. And do you know of any effort in terms of where governments, because of that, are trying to shut down Facebook in terms of access? Sheryl Sandberg: And there are places we’re not available. Well, China’s obviously the big one. We’re not broadly available. Charlie Rose: So how do you see that going into China, because — and if in fact it requires some sense of censorship, does that make it a “don’t go”? Sheryl Sandberg: You know, if your mission is to connect the entire world for all the reasons we’ve been talking about, you can’t connect the whole world and not China. Charlie Rose: A billion and a half people. Mark Zuckerberg: Well, we’ll issues. But since, for right now, we’re not available, and we don’t have an immediate path to become available, it not — these are not policy decisions we have to make. Sheryl Sandberg: Not on the immediate horizon. Charlie Rose: – to go into China. And the reason is, though, is it because of what happened to Google? Sheryl Sandberg: So it’s not really our choice. It’s the government’s choice, you know. We’re not available because they’ve chosen to make us not available. Charlie Rose: Because they acted a certain way, you’ve chosen not to go there. Fair enough. Sheryl Sandberg: No, it’s — yeah, yeah. Mark Zuckerberg: Yeah. And then at some point I think there would be some discussion around what it would take to go there, and then we’d at that point have to figure out whether we were willing to do that. Mark Zuckerberg: But honestly, the way that we look at it now is there’s so many other places in the world where we can connect more people more easily without having to face those hard questions that I think a simple rule in business is, if you do the things that are easier first, then you can actually make a lot of progress. So then I assume, you know, we talk about running Facebook for the long term and over the decades in which we hope to run and build Facebook to be a great company, I would imagine that this will be a question that we have to answer. But, I mean, right now, there’s still so much room for growth in a lot of other countries that it’s just not — it’s not the top thing that we’re worried about right now. Charlie Rose: – connections, the advertising revenue, how important and where do you put making sure that Facebook gets more of the best engineers than anybody else regardless of where you have to steal them? Sheryl Sandberg: First, second and third. Charlie Rose: That’s one, two, three, yeah. Mark Zuckerberg: But it’s really important. Sheryl Sandberg: Attract. We attract them. Charlie Rose: He brought you from Google, and you brought other people from Google. Charlie Rose: Do you think Larry would believe it was attraction or theft? Sheryl Sandberg: Well, we’re not proper in the United States. And I’m fairly certain he would say, but you’re getting at a really important question. Sheryl Sandberg: Which is engineering talent in this country. Sheryl Sandberg: Which there is not enough of. Sheryl Sandberg: – than we have them. Charlie Rose: And you can’t find them. Sheryl Sandberg: Can’t find them. Charlie Rose: How much of that is because of the U.S. immigration policy? Mark Zuckerberg: I’m not sure. I think some of it is that. But a lot of it is just education. I mean, I think that there’s not enough supply of engineers to meet the demand. I mean, all of my friends who have younger siblings who are going to college or high school, I mean, my number one piece of advice is you should learn how to program. I mean, I think that in the future, all kinds of jobs, not even just straight engineering jobs, but all kinds of different jobs are going to involve some element of programming. And, I mean, I just look at, you know, when I was at school, and I remember the average salary that an engineer, one of my computer science classmates got. And it’s gone up at least 50 percent, maybe even doubled in the last seven years since I was at school. And I think the reason is that the economy is shifting, and there are more companies that are growing that are these technology and software focused companies. And the skill set of being able to write code is so highly in demand that — and the amount of engineers who are graduating isn’t growing at a fast enough rate that the people who are there are just in more demand, and they get paid more. Sheryl Sandberg: And we have both an education problem and an immigration problem. Sheryl Sandberg: So it’s an education problem. We do not train — we don’t graduate enough kids from high school. We don’t graduate enough kids from college in this country. And having these kind of skills, we’re just absolutely far off. And also, the immigration policy you talked about is very real. So, you know, someone made a joke. We give a huge percentage of the spots in our engineering undergrad and grad program to people from other countries, and then we kick them out. It’s like a company. We’d have Facebook training, and we train everyone, and then we’d say, but you can’t work here. Go work for our competitor. That’s what we’re doing as a country. People have talked about stapling. Sheryl Sandberg: We should be stapling a visa. Charlie Rose: Stapling a green card to every diploma. Sheryl Sandberg: To every high-tech diploma because those people, not only do they not take jobs from other Americans. They create jobs for other Americans if we could keep them here and have them work in our [unintelligible]. Charlie Rose: I don’t understand why they that can’t be changed, other than it’s caught up in the overall immigration politics. Charlie Rose: Otherwise you would think it’s so obvious. Sheryl Sandberg: We’re not — we’re not experts on the political process. Mark Zuckerberg: It’s above my pay grade. Charlie Rose: But you’re having a different — you have to have, today, a company the size of Facebook, a presence in Washington. You have to have a sense of making sure that Washington knows who you are, and you know what they’re about. Do you know? Sheryl Sandberg: Yeah, no, we do. Sheryl Sandberg: I mean, I think it’s a public education issue. I think, look, we have huge unemployment problem, and we have a growing crisis of people that not only want jobs and need jobs but deserve jobs. And it’s our job to — and so I think people don’t understand that these jobs do not take jobs from other Americans, but they create jobs around them. I mean, there are so many stories on this. We have one guy named Javier Oliveon who works here. He was one of the best engineering students in Spain, nationwide, came to Stanford to get his MBA. Sheryl Sandberg: Started here, works with us, and he created our internationalization tool. He runs our internationalization projects. We serve most of the world from the United States. It’s the opposite of what everyone thinks is happening. We’re not hiring out there to serve here. We’re serving — we entered the visa lottery for him, and we won. We had the jobs for him. Sheryl Sandberg: If we had lost, we would have moved those jobs to wherever he could work. But because we got him a visa, those jobs stayed here. Charlie Rose: But let me ask this question, which is at the heart of the debate that’s going on in America. Charlie Rose: Which is, you know, the competition of America with the rest of the world. Charlie Rose: – more likely to come from China tomorrow? Mark Zuckerberg: Well, if you — I think that there’s actually two big ingredients, right. One of the big parts of the Facebook story was that — you know, I didn’t have to have some master plan at the beginning. I didn’t have to have a lot of money. I literally coded Facebook in my dorm room and launched it from my dorm room. I rented a server for $85 a month, and I funded it by putting an ad on the side, and we’ve funded ever since by putting ads on the side. Mark Zuckerberg: And but literally just starting small and growing it. So I think you need two things. One is the ability to have engineers, right, and educate engineers who can just try out their own ideas. Mark Zuckerberg: And the second is the ability to try out their own ideas, right, and the freedom to do that. And the U.S., I think historically has been extremely good at both. We’ve led in education, and we’ve led in freedom and supporting people trying risky things. Sheryl Sandberg: Free market economics. Sheryl Sandberg: Public policy that supports entrepreneurship. Sheryl Sandberg: In America, you can hire and fire. Sheryl Sandberg: In America, you can start a company without going through endless bureaucratic red tape, even though it’s growing a bit. Sheryl Sandberg: Right? I mean, in America, we’ve had a country of entrepreneurs. Sheryl Sandberg: We have set up our political system so you can start companies. You can close companies. I think people don’t always see the costs of increasing bureaucracy on entrepreneurship. The best people are going to go where they can get the best talent and where they have the best environment to hire. Charlie Rose: Speaking of environment, how is your culture, say, different from the culture that you saw at Google? What is the Facebook culture? Sheryl Sandberg: You know, when I think about this, if you compare Facebook and Google to, you know, most of the world, right, to other companies in other industries, they’re actually, in some ways, incredibly similar. They are founder led. Sheryl Sandberg: Silicon Valley based technology companies that have broad [unintelligible]. Charlie Rose: Driven by engineering. Sheryl Sandberg: That’s right. Driven by engineering. They’re very similar. Sheryl Sandberg: In the little Silicon Valley bubble in which we live, they’re truly different, totally different. Charlie Rose: You’re interested yourself. Mark Zuckerberg: Yeah, I’m interested in hearing [unintelligible]. Sheryl Sandberg: Yeah, but Google is fundamentally about, you know, algorithms and machine burning. Sheryl Sandberg: And that — and that has been very important and continues to be very important. They’re doing a great job. We start from a totally different place. We start from an individual. Who are you? You know, what do you want to do? What do you want to share? You know, for us, the vision of the world is that we are like a hacking culture, and we mean that in the best of ways. We do not mean scary people breaking into your home or anything. Sheryl Sandberg: Or espionage. What we mean is we build things quickly and ship them. So we are not aiming for, you know, perfection that comes over, you know, years, then we ship a product. We don’t work on things for years and then ship it. We work on things. We ship them. We get feedback from the people who use it. We get feedback from the world. We iterate, we iterate, we iterate. We have these great signs around, you know, “Done is better than perfect.” “What would you do if you weren’t afraid?” we’re very much a culture. Charlie Rose: Because the notion of perfect is the enemy of good. Sheryl Sandberg: And a culture of very, very rapid, very rapid innovation. Sheryl Sandberg: Well, he’s never worked anywhere else. Charlie Rose: That’s true. So therefore how did you know what kind of culture you wanted? Mark Zuckerberg: Well, I think it sits [spelled phonetically] from the type of things that we want to build, right? So we’re trying to help people connect with all these different folks, right, and that map of all those different connections needs to get built from the ground up, right? So it is fundamentally about giving people the tools that they need to share the things that they want with the people that they want, make the connections that they want, and bootstrap from nothing to something that’s broader. It is really different from a culture where you’re already taking the web and your primary mission is okay I want to organize something that’s out there, we have this culture where we place a really big premium on moving quickly right and one of the big theories that I had about that was that all technology companies and probably all companies just slow down dramatically as they grow, but if we can focus at every step along the way and moving quicker then maybe when we’re around 2,500 or 3,000 people now maybe we move as quickly as you know a company that only has 500 people, right, because we’ve invested so much in building up the infrastructure and tools and also the culture that tells people to take risks and try things out. And I just think that, that ability to build stuff quicker will be a big advantage for us and will help us build better products over the long term. Charlie Rose: I want to talk about the future and competition. There are many people who look to the Silicon Valley and they say there are four platforms out here. It’s Amazon, it’s Apple, it’s Google, it’s Facebook. And what we’re going to witness over the next 10 years is a flat-out war between the four of you for the future. How do you see that? Mark Zuckerberg: I mean, people like to talk about war. You know, there are a lot of ways in which the companies actually work together. There are real competitions in there. But I don’t think that this is going to be the type of situation where there’s one company that wins all the stuff. Charlie Rose: But you’re already getting in each other’s businesses. You know that. They have something called Google+. Charlie Rose: – could deeply compete with the iPad. Mark Zuckerberg: And that’s cool. I mean, we don’t have tablets, though, so we could care less about that. Charlie Rose: There are no borders out here in terms of what you might want to do. Come on, Sheryl. Sheryl Sandberg: There are no borders for us, certainly, right, because we want everything to be social, and we want — prefer everything to be social with Facebook. And so, for us, our goal is really to work across. We want to work on every tablet. Mark Zuckerberg: Right, this is the important stuff. Sheryl Sandberg: And Apple and Amazon, you know, God bless them. They can compete and build lots of different tablets. Charlie Rose: You found a device, and we want to be seen on it. Charlie Rose: Therefore, they go out and they buy Motorola. Charlie Rose: And there are rumors that Microsoft may buy Nokia or something like that. Mark Zuckerberg: Sure, but our goal is not to build a platform; it’s to be across all of them. I mean, because our mission is to help people connect and stay connected with people no matter what devices they’re on, we want to be in all these places. Charlie Rose: You — go ahead — you — go ahead. Sheryl Sandberg: This is also really — sorry — but this is really important. It actually gets back to the differences before retirement with Google and Facebook. There’s one thing that I think is most important that’s to Facebook, which is that we are focused on doing one thing incredibly well. We only really want to do one thing. Sheryl Sandberg: Connect the world. Charlie Rose: Connect the world. Okay, fair enough. Sheryl Sandberg: And be the social technology people use. I think if you look at other companies, all of these companies are doing lots of different things, but we are still, as we grow, doing exactly one thing. Mark Zuckerberg: [unintelligible] were going to go in a different direction with this, because, I mean, it is true, there’s a corollary to what you just said, right. So, it is true we are focused on this one thing, but because there’s all this other stuff out there, that means that Facebook has evolved as a partnership company. Mark Zuckerberg: – which is very different from the way that Apple or Google or Amazon or Microsoft or any of these folks are, right. I mean, if Apple or Google want to build a product, they typically go build it, right. Whereas if Facebook wants to make it so that, you know, we want to help rethink the way that people listen to music or watch movies. What do we do? We build a platform on top of which people connect, and we enable all these different companies, dozens of companies to plug in, companies that are big companies, companies that are small companies, things that don’t even exist. It’s a really different approach than what all these other companies have. Charlie Rose: But the end result is you want to provide a means for people to look at movies, to listen to music, to do all kinds of things. Mark Zuckerberg: But they’re all [unintelligible] other people’s services. Sheryl Sandberg: We don’t want to provide the means. This is the thing. Our one thing that is the basis of our partnership strategy and our partnership approach, we build the social technology. They provide the music. Sheryl Sandberg: They — we don’t — we don’t want people to use Facebook to watch movies or read newspaper articles. Sheryl Sandberg: We want to provide the social technology. So we want them to listen to music on the iPhone or through Apple or through Spotify, anything they want. We want them to watch movies anywhere. 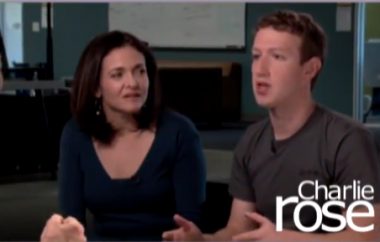 Sheryl Sandberg: We just want Facebook to be how they share wherever they are. And so we do this one thing which is — underlies this huge partnership strategy, and it does make us, I think, pretty different than many of the other companies you’re talking about. Mark Zuckerberg: Just take the movies thing as an example. Sheryl Sandberg: We don’t care where you watch. Mark Zuckerberg: – is that — our partners right now and are building on top of our platform are Netflix and Hulu. Mark Zuckerberg: Right? And I guess Hulu’s more on the TV side. But people can share all kinds of videos that they’re watching. You can see the top things that your friends are watching. So I go to your profile or your timeline and if you want, you can have a box up there that’s what are the TV shows that you watch the most? And I can go ahead and click on it, and it’ll take me right to the Hulu app, and I can start watching that. That, I think is really powerful. The piece that Facebook is doing is saying, okay, we’re friends, right, and allowing you to share that — I want to express to people what are the TV shows that I like. And now Facebook is giving me a place to go see what you want to watch if you want to share that. But then from there, you click on it, and it takes you to Hulu or takes you to Netflix. Or if you want to listen to music, it takes you to Spotify, or it takes you to one of these other companies. Charlie Rose: But is central your sense that the future belongs to social networking, that that’s the future? Mark Zuckerberg: It’s not everything. Mark Zuckerberg: I mean, if you think about it, in your own life, right, with all the things that you do, how much — how many of the things that you do are better when you’re doing them with other people or with your friends? Probably a lot. But not everything, but a big piece of that. Mark Zuckerberg: And I think that we can help power that. But for all of those things, then, you know, some of them we’re going to build ourselves, right, so the core experience where I can go learn stuff about you, right, based on what you’ve shared, we’re going to build that piece, right. The core piece where you can see all of the stuff that’s going on with all of your friends that they wanted to share. We’ll build that piece. Mark Zuckerberg: But the piece where, you know, you go to try to consume a specific type of content, right, I want to see what news my friends are reading. There will be newspapers. Sheryl Sandberg: This is why this matters, right, because we can win along with lots of other people winning. Sheryl Sandberg: And that is totally different, I think about the strategy of what we’re trying to build. Charlie Rose: What don’t you want — go ahead, finish. Charlie Rose: Because you’re the great connector of the world. Sheryl Sandberg: – it is great for the Washington Post and the New York Times and the Huffington Post and anyone who chooses to use our technology which we make available to every news service out there. We’re not trying to replace everyone or do everything. We want to enable everyone — everything to be more social for everyone else. Sheryl Sandberg: It’s always more extreme. Mark Zuckerberg: One thing that we haven’t talked about at all here are games, right. I mean, games is probably the biggest industry today that has gone really social, right. I mean, the incumbent game companies are really being disrupted and are quickly trying to become social. And you have companies like Zynga. Mark Zuckerberg: – which are going public soon and will be valued at most likely at multibillion dollar valuations. And basically all of their games are built on top of Facebook for the most part. Mark Zuckerberg: And a huge number of other companies as well. So I mean, does Facebook build any games? No. We build no games. Charlie Rose: You say that today. Mark Zuckerberg: No, I’m pretty sure we’re not going to build any games. Sheryl Sandberg: [unintelligible] we’re not going to build games. Charlie Rose: Well, why are you so sure? Mark Zuckerberg: Here’s why. Here’s why. Mark Zuckerberg: I’ll tell you why. Charlie Rose: – would never go into retail, and he did. Charlie Rose: So that’s the only reason. Mark Zuckerberg: And we’re doing — what we’re doing is really hard. And we think that we’re better off focusing on this piece. I think that building a great game service is really hard. Building a great music service is really hard. Building a great movie service is really hard. And we just believe that an independent entrepreneur will always beat a division of a big company which is why we think that the strategy of these other companies trying to do everything themselves will inevitably be less successful than an ecosystem where you have someone like Facebook trying to build the core product to help people connect and then independent great companies that are only focused on one or two things doing those things really well. Sheryl Sandberg: And those companies can’t — don’t have the discipline to do it, right. They get big, and everyone wants to do everything, and they just say yes. And then they don’t do everything well. Charlie Rose: At this point, enter this name, Steve Jobs. I’ve had an experience with him once at TIME 100. And he walked over to say hello, and there was — I was talking to a young entrepreneur who was obviously in awe and in — you know, thrilled. It was the greatest moment of his life. There was Steve. Charlie Rose: Did you ever have that conversation with Steve Jobs? Mark Zuckerberg: I don’t know. Mark Zuckerberg: Well, you know, one of the funny things is when you agree with someone, you tend not to talk about it for too long because you just take it as an assumption. So I mean, I think in some of our conversations it might have been like, yeah, that thing, okay, now let’s go talk about something else. Mark Zuckerberg: How to build a team around you, right, that’s focused on building as high quality and good things as you are. How to keep an organization focused, right, when I think the tendency for larger companies is to try to fray and go into all these different areas. Yeah, I mean a lot just on the aesthetics and kind of mission orientation of companies. I mean, Apple is a company that is so focused on just building products that — for their customers and their users. And — and that’s like — it’s such a deep part of their mission is build these beautiful products for their users. And I think we connected a lot on this level of, okay, Facebook has this mission that’s really more than just trying to build a company, right, that has a market cap or a value. It’s like we’re trying to do this thing in the world. And I don’t know, a lot of it I just think we connected on that level. Charlie Rose: Did he ever suggest that Apple might buy Facebook? Sheryl Sandberg: And I think he would have known that. Charlie Rose: Did he raise the question with you? Sheryl Sandberg: – having talked to him about Facebook and Apple, I — he didn’t raise it, but I don’t think he would have because he would have understood that about Mark. Sheryl Sandberg: He’s just like him. He wouldn’t have wanted to sell his company. Charlie Rose: The Walter Isaacson book. Mark Zuckerberg: Yeah. I mean, it’s — and I took it as this amazing compliment. He said, I admire Facebook because you guys don’t want to sell out. Sheryl Sandberg: And I don’t think he would have asked. Mark Zuckerberg: – just wouldn’t have come up. Charlie Rose: You’ve had — I mean, Microsoft owns a piece of Facebook. Sheryl Sandberg: No one even asks any more. Charlie Rose: It’s too big. Nobody can afford you anymore. Charlie Rose: Is that the essential idea? Charlie Rose: But — and you, I mean, can you imagine wanting to buy somebody? Mark Zuckerberg: We buy companies all the time. Charlie Rose: I know, but they’re small, small companies. Charlie Rose: And they’re companies driven by certain expertise. Charlie Rose: – or certain software. Mark Zuckerberg: I don’t think that buying a company or selling a company is necessarily a good or a bad thing. I just think that the key thing that you need to realize is that when you go through a transaction like that, what you are changes, right. And if you’re now owned by someone else, then your goals are going to either quickly or over time become their goals, right? So there are actually I think a lot of compelling reasons why someone would sell a company and why it would advance their mission. I mean, I think, for example, YouTube might have been a good version of this right where they had these huge expenses, and Google funded it and has grown it, and it’s grown into, I think, a really good product, maybe beyond what the founders had even hoped. Charlie Rose: And maybe if Microsoft were able to buy Yahoo!, it might have worked. Mark Zuckerberg: Maybe. It’s hard to tell. But I mean, a lot of the acquisitions that we make at Facebook are, you know, we look at great entrepreneurs out there who are building things. And often, the acquisitions aren’t even to really buy their company or what they’re doing. It’s to get the really talented people who are out there trying to build something cool and say, you know, if you joined Facebook, you could work on this completely different problem. Isn’t this a more important problem? And for the people who answer that question yes, they join. And that’s how we’ve had the most success so far. Mark Zuckerberg: I just don’t even think we think about it that way. Charlie Rose: Okay, well, help me think about it in the right way, how you think about it, because I mean, like the “like” button, you know, it’s a powerful tool. Charlie Rose: It’s for advertisers. Mark Zuckerberg: – people to express — no, not for advertisers. Mark Zuckerberg: This is a core part of what makes Facebook, Facebook, is that we really are focused on users first and for the long term, right? And we believe that if we build a product where people can connect and can express all the things that they want about themselves, that over the very long term we’ll have a lot of people doing that because that’s a core human thing where people want to do that, and they’ll be very active, and we’ll have opportunities to sell advertising and do all these things and build a great business but none of that is the leading thing that we’re pushing for. What we’re pushing for is the mission, we think that if we succeed on that then we’re going to build a great business. Now, if — I just think that there’s this core part of people where they want to express things about themselves. So the question isn’t what do we want to know about people, it’s what do people want to tell about themselves. Right? And we try to answer that question continuously, you know, what do people want to tell about themselves that they can’t tell now? Right, we think this year that one of the big things that people want to express that they haven’t had a way to are what are my favorite songs and different media that I consume. And you know there’s always — there’s been a way for you to type in, okay, my favorite band is Green Day or the Beatles or whatever, but there hasn’t been a way to say okay out of all the songs that I’ve listened to in the last month, here are the top ones, but in the month or so since we’ve launched that functionality on top of platform, people have already chosen to publish more than a billion songs that they’ve listened to into Facebook through partners. And it’s amazing so and it’s because they want to do that. Sheryl Sandberg: And it’s really important to understand that we don’t want people to express anything, we want them to have an opportunity to express what they want to express to the people they want to express it, so privacy has been very core to this service. I think it’s actually one of the big innovations Facebook had, if you think about online services before Facebook, they’re basically open or closed, you know, something you publish on a blog, the blog is open, you’re corporate email [spelled phonetically] closed. Facebook was the first place that one of the core innovations Mark had was actually around privacy. I can take this photo, I can take a photo of the three of us here, I can share it just with my parents, I can share it just with my little group of my high school girlfriends, or I can share it with all of Facebook or the whole world, and every single time you share something on Facebook you have an opportunity to choose who you’re sharing it with. Sheryl Sandberg: And that commitment to our users, that their trust is sacred, that privacy is the most important thing we do, is something that’s been here throughout, and it’s really important for people. Charlie Rose: But having said all of that, when you’ve gotten in trouble it’s bulk [spelled phonetically] on the issue of privacy. Mark Zuckerberg: Yeah, I agree, and I mean it’s something that — I think that just speaks to how important and fundamental of an issue that is. Mark Zuckerberg: All right, when I was talking a minute ago about what are the ways that people want to share that we can make happen this year, one of the core things that flows through all of this is that I’d say probably this point still the vast majority of people don’t want to share everything, or don’t want to share anything with everyone publicly. But if you give people tools so that they can share with just their friends, or just one group of friends, or just their family, then they’ll do that. Charlie Rose: Okay, but are they always the wisest people to know what they want to share and how sharing might be bound. Charlie Rose: You trust the judgment of most people to know who they want to share with. Mark Zuckerberg: Yeah, and I think that people go through a learning process too where I mean maybe when social networks were first ramping up on the web some people shared a few things too broadly but I think that, that’s part of the reason why I think Facebook has grown is I think Facebook largely existed after that the friends [spelled phonetically] during the MySpace phase of the social web and at a point where people were already sophisticated enough to realize hey, you know, I want to share different things with different people, I’m going to use these privacy control that Facebook has given me, that Facebook is really the first company that has built these controls so that you can share things with just your friends or I can share vacation photos from my family vacation with just my family if I want, or I can do all these different things, and I think that, that’s one of the big enablers on the service. Sheryl Sandberg: And it’s something we continue to evolve so control is what matters here. People want control. They want to share what they want with who they want and as long as, as we will allow [spelled phonetically] products, we continue on the control, so for example we are launching, we’ve already unveiled, Mark unveiled a number of weeks ago in the next bunch of weeks we’re making our timeline, our new profile available to everyone. Charlie Rose: What is that? Sheryl Sandberg: It’s — so right now you have a profile, and the timeline is a more visual representation of who you are and includes further back in your life, not just when Facebook started, but further back. So I’ve actually spent the last week uploading childhood pictures. But here’s what matters. I can go back and change the privacy controls on something I’ve already — so if I go back now and build my timeline and I say, “Oh, I shared that with this group of people. I actually want to share that with more people or fewer,” we are giving that control. So it matters as people learn is that they have the controls they need to share with who they want. And that’s something we are continuing to work on. Charlie Rose: There are also these stories that you read about in terms of if somebody has something on their Facebook page that somebody got access to and therefore they didn’t get hired, something did not happen that might have happened because they were silly enough or somehow to put something on their Facebook page that rebounded to their detriment. Sheryl Sandberg: And people make cell phone calls that rebound to their detriment. Sheryl Sandberg: E-mail as well, or they put something down on their resume. It’s not that people don’t make mistakes, but the information you put on Facebook is only available to employers if you’ve shared it to those people, if you’ve shared it openly. Mark Zuckerberg: No, I had caller ID. Sheryl Sandberg: Do you remember before caller ID? Mark Zuckerberg: Yeah, yeah, yeah. Sheryl Sandberg: No, he says he does. Charlie Rose: Oh, you do? Sheryl Sandberg: All right, that kind of sort of counts, but when caller ID came out, there was a big privacy uproar. People thought it was a violation of the caller’s privacy that they’re number would show. There was talk of legislation. There was talk of states banning it. Charlie Rose: There was talk of a way you could avoid it being seen and all that. Sheryl Sandberg: Ways you could avoid it being seen because it was considered — I don’t know anyone who answers a call that doesn’t have caller ID now because it’s not considered a violation of that privacy. It’s considered my right to know who’s calling me. Otherwise, why would I answer? And so, yes, when you are an early leader like we are in technology, there is always concern, and you’re going to continue to hear concerns. Charlie Rose: You know why I have caller ID? Because when I’m calling people, I want them to know it’s me calling, other than “unknown” because I feel that they’re more likely to answer my call if they know it’s me. Charlie Rose: Okay, so, but tell me where the boundaries are about privacy, that you think that we ought to take note of at this moment. Because the privacy question most frequently comes back to Facebook. Mark Zuckerberg: Well, here’s the way that I think about it. I think it’s really about control, right. People have things that they want to share with maybe a single person or a small group, and they have things that they’d want to share more broadly. And the real question for me is do people have the tools that they need in order to make those decisions well. And I think that it’s actually really important that Facebook continually makes it easier and easier to make those decisions, because the demographics of people who are using Facebook are changing as well, right. I mean, we started off with these people in college, right, who use computers every single day. And now, you know, we’re up to 800 million-plus users. We have people using the site who it’s one of the only things that they do on a computer, and maybe they’re not computer savvy, right, or they don’t have — they don’t spend a lot of time trying to figure out privacy control. So what we’ve done in the last year is we’ve made it so that any time you to share anything, the privacy control is now right there, and it says exactly who you’re going to share with. If you’re going to be sharing publicly, there’s a little globe and it says the word “public.” And if you’re going to be sharing with friends, there’s this icon of a few people and it says the word “friends,” and you can just click and you can change that really easily every time you post anything. And back where we were getting started seven years ago, I don’t know if that was necessary because the college students and early adopter-type folks just had this intuitive understanding of how the service worked. But now, I just think that the boundaries, it’s getting more and more important to be increasingly clear and give people those controls. And that’s what we’re trying to do. And I don’t think we’re at the end. I think we’re going to need to keep on making it easier and easier, but that’s our mission, right. I mean, we have to do that because now, if people feel like they don’t have control over how they’re sharing things, then we’re failing them. I mean, we’re making it so they can share a lot of the stuff that they want to. Sheryl Sandberg: I think it is the case that people talk about Facebook and privacy a lot, and I think it will continue to be the case, but it’s because we lead in this area, meaning that we are the most privacy-focused place for anyone to share anything. Charlie Rose: Well, no, it’s because you have more information about everybody than anybody else. Mark Zuckerberg: This is an important point though. Sheryl Sandberg: Well, Elliot Trig [spelled phonetically] has this great — Elliot Trig has this great story he tells. He works [unintelligible] company. He says there’s this old joke, where, you know, the man loses his keys and he’s looking for the keys under the lamppost, and someone says, “Well, why are you looking under the light? They’re clearly not here.” He’s like, “Well, this is the only reason I can — only place I can see. If I go over there.” We are focused on privacy. We care the most about privacy. Our business model is by far the most privacy friendly to consumers. And we talk about it the most. And I think we’re the light. We’re the light. We are the transparent place where people can understand and I think you will continue to see conversations about Facebook in privacy. But it’s because we lead and we care so much about it. Mark Zuckerberg: I think it’s worth explaining this a bit more, though. Mark Zuckerberg: I mean, when you’re saying that we’re the light, it’s because, sure, people have a lot of information on Facebook. But that’s information that they’ve put into the service. Charlie Rose: But do you find that a bit scary? Sheryl Sandberg: There’s no light. Mark Zuckerberg: – than what’s happening on Facebook. Sheryl Sandberg: It’s the dark. Mark Zuckerberg: – target say, okay, I want to — I want to advertise — like I’m a band, and I’m coming to the Bay Area, I’m going to advertise to people who like a band, and they’re going to — those people only fit if they’ve put in that they like that band. Mark Zuckerberg: – it appears scarier. But in reality, you have control over every single thing that you’ve shared on Facebook. You can take it down and — [unintelligible]. Charlie Rose: If you take it down, you say look, enough, gone. Charlie Rose: And what else? What happens if you die? What happens then? Sheryl Sandberg: If you let us know, we memorialize the page. Mark Zuckerberg: – we’ll memorialize the page. Charlie Rose: – take them down and erase forever. Sheryl Sandberg: Yeah, you can erase forever. Sheryl Sandberg: It’s not perfect in the sense of if I put something up, I can take it down, it’s gone. Sheryl Sandberg: – won’t go down. It’s out there. And that’s one of the things. But it really is the point that the only thing Facebook knows about you are things you’ve done and told us. It is self-reported. Charlie Rose: But the genius of Facebook is that it has the possibility of sending it out like nothing else to more places. Sheryl Sandberg: We never — Facebook never sends any information out about anyone. Charlie Rose: I understand that. But it goes out because Facebook has a system that allows that. Sheryl Sandberg: Allows other people to share. Charlie Rose: Let me talk two things about, one you, the empowerment of women and then a sense of who you represent. This is a place that you are — you stand out because you and Marissa and a few others, you know, is — is technology a place that women can find the kind of opportunity that you want them to find? Does it need mentoring and all kinds of other things that people like Sheryl Sandberg can deliver? Sheryl Sandberg: Look, I think the issue of women in the economy and the country is a huge one. It’s something that I care passionately about and Mark cares passionately about and has helped me too. You know, we have basically a stalled revolution for women. You know, women became 50 percent of the college graduates in this country in 1981 and then made steady progress, more college degrees, more graduate degrees, more manager positions. Over — and we’re still making progress. Over the last ten years, women have stalled out at the top. Women in corporate America have 15 to 16 percent of the board seats and of the kind of CEO [spelled phonetically], the high-level jobs, and that has not moved in ten years. Sheryl Sandberg: Howard and Heidi. Charlie Rose: – Howard and Heidi, yeah. Sheryl Sandberg: Yeah. And the point of that study is that success and likability are positively correlated for men and negatively for women. So as a man gets more powerful and more successful, everyone — men and women like him more. And as a woman gets more powerful and successful, everyone, including women like them less. Canaleta [spelled phonetically] called it self-doubt and self-defense. Charlie Rose: Now, what does it mean to be Mark Zuckerberg today, in terms of what — the revolution, in terms of the attention? I mean, a sense of how you adjust and how you assimilate and how you, in a sense, make sure that you are in command of it, and it’s not in command of you. Mark Zuckerberg: I don’t know. I think a big piece is just to try to stay grounded and, I don’t know, have a pretty simple life, right. I mean, I don’t — so people say that, you know, the company is so valuable, and there are all these people there and all that. But I think the number of people who I work with I stay focused on keeping them who I think are really good people, really smart, intellectually curious. I spend a lot of time just, you know, with my girlfriend and my dog. And I mean, we don’t have a lot of furniture in our house, so it’s really simple. And we’re trying to build products for everyone in the world, right. And you don’t want to get isolated to do that. We have a very open culture at the company where we foster a lot of interaction between not just me and people but between everyone else. It’s an open floor plan. People have these desks where no one really has an office. I mean, I have a room where I meet with people. But it has all glass so everyone can see into it and see what’s going on. I don’t know. I just think that — actually, it’s really connected to the mission of the company. I think that more flow of information, the ability to stay connected to more people makes people more effective as people. And I mean, that’s true socially. It makes you have more fun, right. It feels better to be more connected to all these people. You have a richer life. But I also think in terms of doing work and in terms of learning and evolving as a person, you just grow more when you get more people’s perspectives and when you’re more connected and have more of a flow from people. So I don’t know. I think that’s really it. I mean, I really try to live the mission of the company and embody that for the company and keep everything else in my life extremely simple. Sheryl Sandberg: Yeah. It’s interesting to watch as closely as I have. Like since I’ve known Mark over the last four years, in some ways, everything’s changed, in some ways, nothing has changed. So what’s changed is, you know, he was on his way to being Mark Zuckerberg four years ago. But now he’s like Mark Zuckerberg. Charlie Rose: He is Mark Zuckerberg. Sheryl Sandberg: Yeah, we used to walk around — right. Sheryl Sandberg: But we could walk around Palo Alto four years ago, and people didn’t like look. And now they do. But when you actually know him, like nothing’s changed. He wears actually exactly the same thing even though it’s a new T-shirt. But he wears the same thing. He has the same girlfriend. Sheryl Sandberg: He likes the same restaurants, not necessarily the restaurants I like, right. Like really nothing’s changed. He has the same group of friends. And I think the ability — I think we all focus on it here, but like stay grounded. Don’t change your social circles. You know, I have the same best friends I’ve had since I was in high school. Mark has the same friends he’s had since I was here. And that stuff really matters. Live your regular life and just try to build stuff that matters. It’s what we’re just trying to do. Charlie Rose: Thank you for this. Great to see you. Sheryl Sandberg: Thank you for visiting us. Charlie Rose: Thank you. It’s a pleasure to be here. Conversation with Sheryl Sandberg and Mark Zuckerberg at their place in California. Thank you for joining us. See you next time.